With its stunning inlaid pearl shell altar making it arguably one of the most beautiful churches in Australia, Sacred Heart Church at Beagle Bay, Western Australia, is celebrating 100 years of extraordinary history. Source: ABC News. Located in the centre of the majority Aboriginal community on the Dampier Peninsula, the church has stood witness to world wars, the Stolen Generations, and Indigenous self-determination. Gleaming white and often described as a slice of Germany in Australia’s far north-west, the church can seem incongruous to those who do not appreciate the long history of connection between Kimberley Aboriginal people and Catholicism. 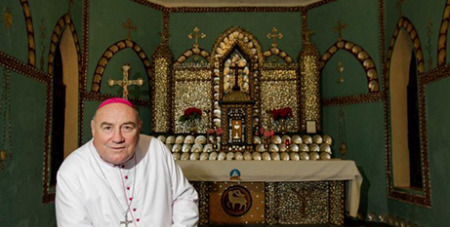 The spectacular mother of pearl altar combines Catholic iconography with symbols of traditional Indigenous life, created in mosaic from gleaming pearl shell. Assistant priest Christopher Knapman said the church always attracted a lot of attention from visitors who made the 150-kilometre drive north of the pearling town of Broome up a notoriously rough dirt track. “We have so many people coming to visit Beagle Bay church,” Fr Knapman said. “I think that they’re most struck by the fact that we have this extraordinary church in what seems like the middle of nowhere. The church was built during WWI. The Catholic clergy had arrived in the Kimberley nearly three decades earlier, following pearl shell luggers and pastoralists. Broome Bishop Christopher Saunders said the then-bishop of Perth sent priests and nuns to protect Aboriginal people from these frontier industries. “The protectorate being to protect Aboriginal people on the land against the marauding pearlers, who were notorious in this neck of the woods for what is euphemistically called ‘blackbirding’,” Bishop Saunders said. But the war with Germany brought intense pressure on the Beagle Bay mission, with the mostly German priests placed under house arrest and many working-age men leaving for Europe. “In a moment of desperation Fr Bachmair suggested to the community there, ‘We should build a church’,” Bishop Saunders said.